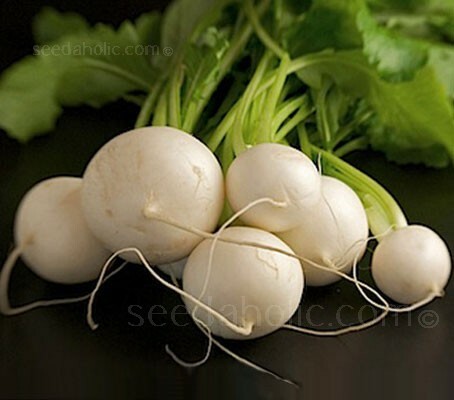 Turnip ‘Snowball’ is a very popular first-class, globe variety with solid flesh and a juicy, sweet, mild flavour. It is an heirloom turnip that was introduced before 1885. Pure white flesh as its name suggests, Snowball is best harvested when no larger than a tennis ball and can also be enjoyed when much smaller. Snowball is superb for both table and exhibition, they are a fast crop, being ready in just five to eight weeks from sowing. It will yield a good supply from early summer to early winter, and the tops make most nutritious and tasty greens. Large woody turnips of old have mainly been replaced with smaller white varieties that are delicious grated raw into a salad or as a welcome side dish, leaving the swedes to take over in the stew department! It has been trialed, tested and is recommended by the National Institute of Agricultural Botany. All brassica crops grow best in partial-shade, in firm, fertile, free-draining soil. For the best crops start digging over your soil in autumn, removing any stones you find and working in plenty of well-rotted manure or compost. Because they are fast growing, they require a higher level of fertility. Ideally the soil should have been manured for a previous crop and the pH level should be around neutral. Like most brassicas they do not like an acid soil so add lime to the soil if necessary. A week or so before sowing provide a general purpose fertiliser like fish, blood & bone. Tread on the soil to remove any air pockets and make the surface very firm. Turnips are easily grown in containers. Small roots can be grown in wide containers but they must be at least 20cm (8in) deep. Turnips are a cool-weather crop that require 30 to 60 days to come to harvest and grow best in temperatures from 5 to 24°C (40 to 75°F). They are best harvested before temperatures exceed 24°C (75°F) as hot temperatures cause the roots to become woody. In temperate climates (ones with a growing season of 5 to 6 months), seeds are sown in spring for an early summer harvest and in late summer for a late autumn to early winter harvest. If sown under cloches, sowing can start as early as late February. As turnips grow on they become less tender and flavoursome so successional sowing every two weeks ensures a constant supply of young and sweet turnips. Turnip seedlings do not transplant well so seeds are sown directly into the garden. Sow seeds 12mm (½in) deep and rows should be spaced 15cm (6in) apart. The seeds should be sown thinly, as this reduces the amount of future thinning necessary and potential risk from pests. Plan for around 5 to 10 plants per household member. Rake in lightly and water often in dry weather. Germination takes place in less than a week. When grown for their roots, it is important to start thinning as soon as possible because they are fast growing. If they are allowed to crowd, decent roots will not develop. Thin small rooted varieties to to 7cm (3in), so that they don’t touch. Maincrop varieties that are sown in July and August require a larger spacing, 25cm (10in), to allow the larger root to develop for harvesting in November and December. The thinnings can be eaten as greens. If growing turnips for greens only, do not thin out. Turnips are a relatively trouble free crop, cultivation is mainly a matter of keeping them weed free and watering in dry periods to avoid woody texture and split skins. Turnips prefer to be watered deeply before the soil dries out entirely. Frequent shallow watering or erratic watering can bring on early flowering, resulting in poor root development. If growing for greens, leave the plants close together, and pick your greens without pulling out the roots. Leaving the plants close together discourages growth of the large bulbous stem, and the greens will replenish consistently. A higher nitrogen content in the soil encourages production of leaves rather than the root bulb. Turnips thrive in the company of peas and onions as well as with other members of the onion family. They should not be planted near other root vegetables such as potatoes, carrots and radish as they will compete for the same resources. If growing for greens, they are best harvested when 10 to 15cm (4 to 6in) tall, they can be cut when up to 30cm (12in) but flavour and texture reduce in quality if allowed to grow larger then this. Cut the outside leaves first and leave to resprout. Thinned seedlings can also be harvested for greens. Rotate your crops, planting brassicas, of any kinds, in the same ground more often than once every four years runs the risk of club root infestation and once you have it, the ground is useless for up to a decade. Don't take needless chances, even with catch crops of radishes. Young, golf ball sized, turnips can be grated and eaten raw in salads. The smaller roots can be boiled whole for around 25 to 30 minutes. Main crops will require peeling before boiling, treat as swedes. Enjoy them mashed, roasted, in soups and casseroles. To freeze, peel and dice, blanch for two minutes, plunge into cold water, drain and dry with paper towel, pack in meal sized amounts. Both roots and green tops are high in vitamin C and fibre. Turnips retain their nutrients well when cooked. Turnip leaves are sometimes eaten as greens, often called turnip tops they resemble mustard greens in flavour. They can be blanched, sautéed or used fresh as a bitter and textural green in salads. Smaller leaves are preferred; however, any bitter taste of larger leaves can be reduced by pouring off the water from initial boiling and replacing it with fresh water. Regular turnip crops are left in the ground as the plants can withstand freezing temperatures in the air until the ground freezes. However baby turnip varieties should be harvested young. Thanks to their thin skin, they don’t store long like the more common, thick-skinned storage types. They will store for a short while but are not considered a tradition cellar vegetable as they will not maintain their firmness and flavour if stored throughout the winter, which common turnips as well and the turnip's parent, the swede (rutabaga) are often utilised for. Most very small turnips (also called baby turnips) are specialty varieties. They are available in white, yellow, orange and red-fleshed varieties. Their flavour is mild, so they can be eaten raw in salads like radishes and other vegetables. The turnip originated in northern Europe in about 2000 BC. The domesticated turnip can be traced as far back as the Hellenistic Period of Greek civilisation (approximately 300 BCE). Its horticultural relevance pre-dates the arrival of the potato. Historically the turnip has had dual purpose as a crop for both humans and animals, unfortunately, it was their use as animal fodder that long ago caused nobles to scorn them as poor-man’s food. Thank heavens we now live in more enlightened times. Turnips made their way to China and Japan about 1,300 years ago where the white Tokyo-type turnips were developed. Golden turnips have European origins, they were first cultivated in France in the 1800's. In Scotland and the North of England they date back at least to the early 19th century. They were registered in the United States patent office in 1855 as Robertson’s Gold Ball. In the south of England the smaller white vegetables are called turnips, while the larger yellow ones are referred to as swedes (from 'Swedish turnip') In the USA, turnips are the same, but swedes are usually called rutabagas. In Scotland, Ireland, northern England and parts of Canada, the usage is confusingly reversed, with the yellow vegetables being called turnips or neeps, and the white ones swedes. Neeps are mashed and eaten with haggis, traditionally on Burns Night.